Snana-Yatra this Sunday! ***NOTE: BATHING WILL TAKE PLACE FROM 4:30PM-6:00PM*** ~ The Toronto Hare Krishna Temple! A sure sign that the annual Festival of India (Ratha-Yatra) is just around the corner (July 16-17, 2011) is the annual Jagannatha Snana-Yatra festival! Snana-Yatra, a wonderful festival, wherein Lord Jagannatha, Lord Balarama and Lady Subhadra will be bathed amidst amazing kirtan and chanting! After the bathing ceremony (Snana-Yatra), Lord Jagannātha apparently becomes sick. He is therefore removed to His private quarters, where no one can see Him. 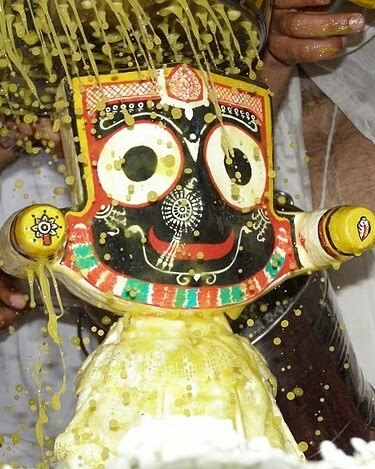 Actually, during this period the body of the Jagannātha Deity is repainted, this is called nava-yauvana. Ohhh! We'll try to post some pics or maybe the web broadcast video! It is on July 16th and 17th - coming up in less than 2 weeks! The parade will start from Yonge and Bloor at 11am on Saturday, July 16 and the festival will be at Centre Island for the weekend. Timings on Saturday, Jul 16 at the Island is from 12:00pm - 9:00pm and on Sunday, July 17 is from 12:00pm - 5:00pm. Please visit our website, www.festivalofindia.ca for more information!